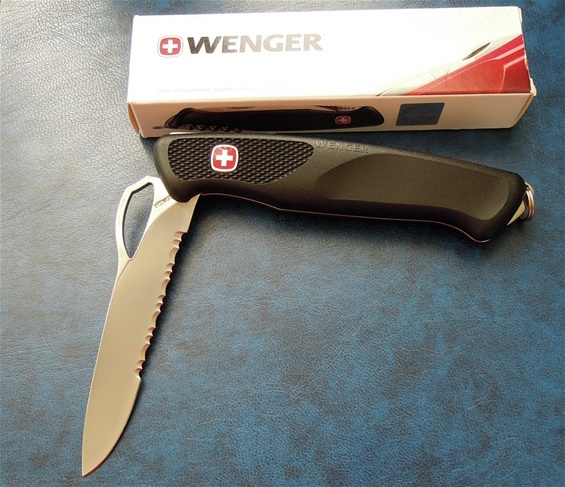 This is my latest Wenger knife and this only has a knife blade and key ring. This is a very good safety knife because it got a combination edge. The serrated part will cut belts, webbing and rope very well. It is very lightweight, only 92 grams. It does not have the grip inlays still it is a safe handle because it is ergonomic with the continuation of the evolution. It got the ribbed parts at the front section that will increase safety well. Ranger knife blades are very well developed at they are super modern in design and functionality. They are flexible and sturdy. The locking mechanism is there to prevent accidental closing like explained on my webpage. The Ranger 151 was part of the 2007 release with the New Ranger`s redesigned a-z. There are advantages with serrated edges so please take the time to read my pages on Rescue blades. The serrations will with a sawing or press motion help cutting tough materials. It will also increase the durability of the sharpness. Because of the waves or serrations you also increase the length of the cutting surface. 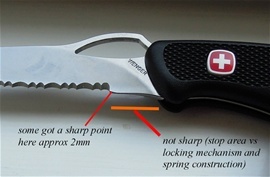 The serrated edge takes 5,1cm of the blade but in reality the edge is longer. Because the Ranger 151 only got one blade it is extra comfortable in reverse. The thumb can rest better. On some Ranger blades on the blunt area (see picture guide) got a sharp area with variations with 1 or 2 millimeters. Usually they are not sharp there but on some there is a continuation related to the serrations. These I believe are production variations and not 100% part of the edge. It does help the serrations that said.